Margaret led a walk across the south side of Edinburgh from Hermitage Braid to Portobello Beach. The route linked up a variety of parks and green spaces using pedestrian paths and only short sections of roadside pavement. The weather was bright throughout the walk with a slight wind. The party set off following the Braid Burn through the well wooded Hermitage of Braid where the paths were covered in lovely autumn leaves in a variety of colours. From the House built in the 1780’s a short detour brought the walkers to the park benches at Blackford Pond which was an excellent stop for coffee. Returning to the path by the Braid Burn the group continued along the valley which, hidden from urban development retains very much a rural feel. We then continued to the Cameron Toll Inch Park and Craigmillar Castle. In the 1890’s Lady Susan walked daily from Inch House to the castle along a path which became known as her walk. Much of the path has been built over but following Old Dalkeith Road we came to a doorway in a old stone wall. Stepping through it we were instantly in dark mature woodland. Without noticing the group climbed a low hill, crossed a field and ahead was the new Royal Infirmary and a short distance on was Craigmillar Castle; which was built I the 15thcentury. Walkers were delighted to look across the Forth to find Kirkcaldy easily picked out by the Ravenscraig Flats. Down through the woods to Peffermill we met the Braid Burn again and followed it to Duddingston Playing fields. Here with a magnificent view of Arthur’s Seat and in the shelter of trees the walkers enjoyed lunch. Afterwards they continued by the right of way across Duddinston Golf Course, through houses into the Figgate Burn Park. The Figgate Burn takes the water from the Braid Burn into the Forth at Portobello. Along the stream side path, the group reached the site of Clay Pitts which stimulated the growth of Portobello in the mid eighteenth century. These are now a popular small-scale wildlife and wetland area. Leaving the park, the walkers headed down through the town crossed Rosenfield Park and discovered the plaque on the cottage where Harry Lauder was born. Two preserved bottle kilns used for firing pottery until the early 1970’s was a final surprise before we reached the end of the walk on the promenade and finally the beach. The walk finished with a visit to the Beach Café on the promenade where welcome refreshments were enjoyed. Jim led a group of 14 ramblers on the ‘Falkland Circular’ walk. It was a nice calm Sunday morning when the group set off from the main Falkland Car Park and headed for Falkland Estate. As they entered the estate the duck pond was looking very picturesque in the autumn sunshine. The group stayed on the main road until they reached the entrance to Maspie Den which was looking magnificent with the autumn colours on the trees and the waterfalls on the burn sparking in the sunshine. The group proceeded to the top of the Den then onto Craigmead with a stop for coffee at the picnic tables. With a cold wind the temperature dropped a bit as the sun became hidden behind some clouds. On leaving Craigmead the group followed the path around the base of East Lomond towards the Relay Station on the other side of the hill vies which provided great views of Fife and the Firth of Forth. After lunch at the picnic tables the group enjoyed great views towards Largo Law the group headed down to the A912, crossed over to Freuchie Den for a pleasant walk along the burn between Little Freuchie and Freuchie following Lady bank Road for a short distance before circling round some quiet country roads towards Newton of Falkland. From here the group proceeded to Falkland through some farmland which provided great views of Falkland and the Lomond Hills. This was a perfect walking day and was much enjoyed by the whole group before heading back to cars for the journey home. 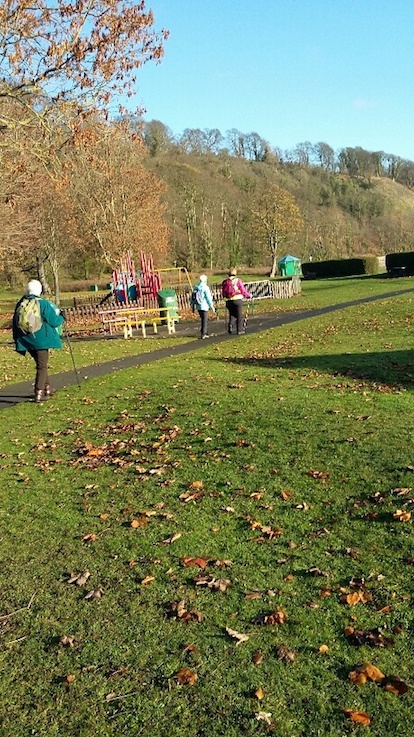 After arriving by train at Aberdour station the group of 8 Kirkcaldy Ramblers were joined by two visitors for the coastal path walk back to Kirkcaldy. 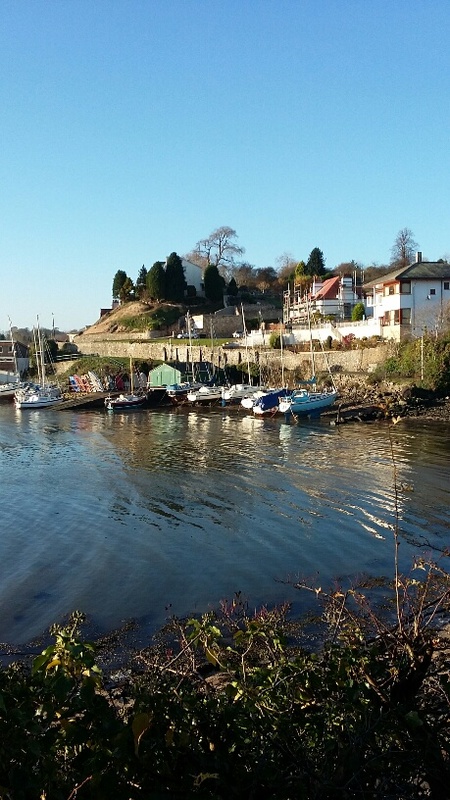 On this bright fresh sunny morning we headed from the station to the coastal path and started the walk from Aberdour harbour were a number of boats were docked for the winter months and the tide was coming in. in the 1850’s this was a popular destination for pleasure steamers from Leith which led to the development of some of hotels which still stand in Aberdour today. As we walked through the woodland to the Silver Sands, there was a lovely clear view across the forth and the island of Inchcolm, with the silhouette of the abbey in clear view. A few cyclists and dog walks were also on our route making the most of the sunny November day. As we approached Burntisland you could get a sense of the size of the old British Aluminium works site as you could see how many new houses had been built on that site. 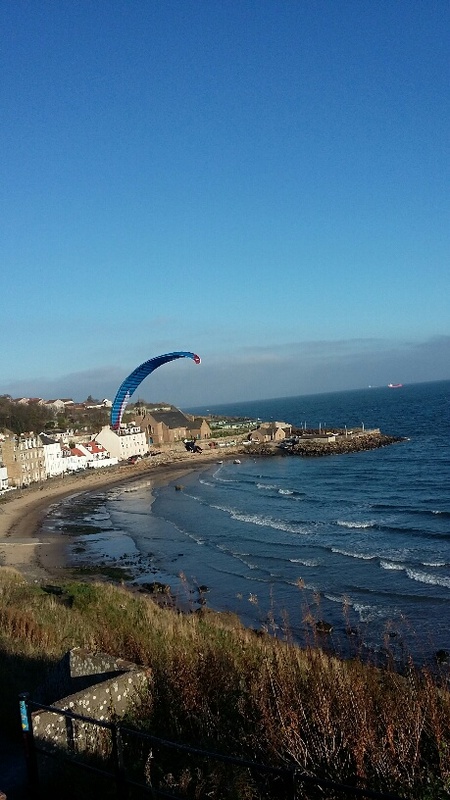 Due to high tide our walk progressed on the main road from Burntisland to Kinghorn where we dropped back onto the coastal path at the old Carousel Building for our lunch stop and enjoyed watching the paragliders attempts to catch the wind and fly down to the beach. The group proceeded back on the coastal path route back to Kirkcaldy with a stop at Morrisons for coffee before heading to Dunnikier Golf Club for our annual pre-Christmas meal where the group was joined by other members and enjoyed a delicious 3 course meal with excellent service from the golf club staff. Ruth led a group of Kirkcaldy Ramblers members and visitors on a Woodland Wander at Falkland. The day was fine with bright sunshine, though a chilly wind blew as the party left the main car park in the village and headed along the High Street. Turning into Mill Wynd and onto the path along the embankment into Falkland Estate, the group soon reached welcome shelter amongst mature trees and were given a taste of the good views they would enjoy at various points later in the walk. They continued on the path round the cricket field and then by fields and wooded areas to Chancefield. Along the way the took time to admire views north to Auchtermuchty and the hills beyond, and the southern skyline defined by the Lomond Hills with their lower slopes cloaked in mature woodland and dark forest. Black Hill stood out, marked by the Tyndall-Bruce monument perched on its bluff like a lighthouse above a sea of dark green. At the foot of the hill a grassy bank provided good seating for a coffee break before the group contoured uphill below the monument on tracks and footpaths through thick stands of conifers. Emerging from an area of lighter forest and rhododendron undergrowth, walkers enjoyed a magnificent view of the upper slopes of Falkland Hill. Taking a recently-created path down a shrubby den beside a small burn they crossed to the main path climbing the ridge alongside Maspie Den. This led them up into Coalpit Den and the new paths branching off through the scrub and birch trees there. A sheltered spot where a small burn tumbled down a rocky hillside well-hidden from the main path up to Craigmead made a comfortable place to stop for lunch. After lunch the group continued on the new paths down Coalpit Den and were rewarded with lovely views of the North Fife hills bathed in glorious early-afternoon sunshine. Rejoining the main path the party descended to the woods around Falkland House and passed the very old Monkey Puzzle tree. The path through the fields by the Mausoleum commemorating family who died in the First World War took them on to the main drive at the duck pond by the lodge. It was then just a short walk along West Port and by Back Dykes to return to the cars. Before leaving the village most of the group stayed to enjoy a chat over various afternoon refreshments in the comfort of the bar at the Covenanters Inn.